Packrat's two-year-old twins are known for sticking their fingers into birthday cakes the instant they get the chance, so when his birthday cake was unboxed at lunch today and they were trying to paw their way into it (even as Ondine and other family members tried to restrain them), I unwittingly channelled the deepest teacherly voice I ever mustered in my five-year career and issued a no-nonsense, "Jor---dan." At which point the girl twin retracted her finger and looked up at me with big, big eyes. Then I dissolved into laughter and said to my mother (who's one of her regular caregivers), "Oh dear, I don't know where that came from." But hey, the kids kept their fingers out of the cake till Packrat blew out the candles. I've been playing around with foursquare this week, which allows you to inform your friends of your whereabouts so that they can, serendipity permitting, rendezvous with stalk you. I'm trying to use it sensibly by, for instance, adopting a befriending policy akin to Lucian's: "You need to be someone I'd walk up to and say hi. No offence." I'm also playing around with it to see how much human behaviour --- all right, my behaviour --- can be swayed by the possibility of racking up points. So far I've been chagrined that I zipped all over to all sorts of interesting places yesterday (not even counting the Jack of Hearts Mystery Tour), but clean forgot to "check in" on foursquare. 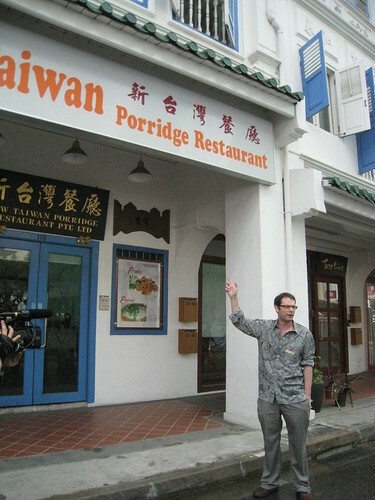 However today I dutifully remembered to do so --- in the middle of pork porridge breakfast at the delightfully old-school Carlton Restaurant, no less. All this, by the way, for points that aren't good for anything "but bragging rights for now", according to the official foursquare FAQ. "How I use Facebook for reporting (and what I won’t do)" by Kashmir Hill at True/Slant (via Smart People I Know) --- which articulates research methods on Facebook I've noticed, used or suspected-as-much over the last year or so, even within a narrow Singapore context. "Who Watches the Watchers on Twitter?" by Darren Barefoot --- whose experience with @TransitPolice made me sit up and pay attention. Not that I'm about to drop off foursquare (or Facebook), but, you know. Let's pay attention. Three women in their mid-thirties met for dinner, and we all turned up in grey tops and either jeans or black pants. "Eh, we can form a girl band already," I said when we met at Raffles City. After drinks, I took a taxi home and asked the cab driver for a receipt. He said, "What company you working for? Drinking still can claim." Last year, I spent October and November in Vietnam, to research and write three chapters for Lonely Planet Vietnam (10th edition, published in July 2009). Naturally, some things have already changed. Currencies fluctuate, businesses relocate or close or are renamed, and, well, stuff happens. So I've decided to keep a little laundry list here of errata and updates to my chapters: North-Central Vietnam, Central Vietnam and Central Highlands. All the information here has either been verified by me in person or comes to me via a trusted source (e.g. a business owner whom I've met in person before). I'll maintain this list until Lonely Planet commissions publishes the next edition of the Vietnam guidebook. It's an unofficial update page because absolutely nobody is paying me to do this. The following notes apply only to the 10th edition of Lonely Planet Vietnam, which was published in July 2009. The italicised date in parenthesis at the end of each note indicates when I learned of the erratum or change. 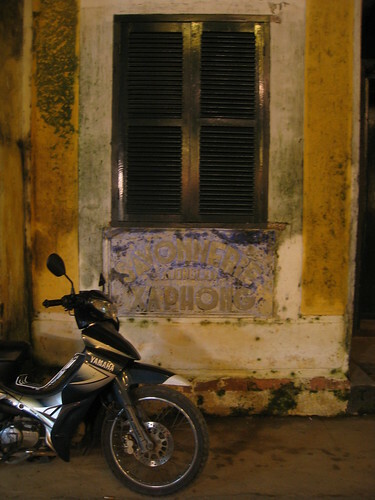 p 246-247: On the map of Hoi An, the shop Tuoi Ngoc (#88) is in the wrong location. It should be at 103 D Tran Phu, in grid square C3 (6 November 2009). p 322: Dreams Hotel (151 D Phan Dinh Phung) in Dalat is missing the "Our Pick" icon, due to a production error (31 July 2009). p 202: The admission fee to Phong Nha Cave is now 30,000 VND (2 April 2009). p 217: Stop and Go Cafe in Hue has moved around the corner to 3 D Hung Vuong, just before Trang Tien Bridge. The phone number is unchanged (8 November 2009). pp. 239-240: Bread of Life bakery-restaurant is moving to 4 D Dong Da, north of the Song Han Bridge (see grid area C1 on the map on p. 236) (10 March 2011). p 247: There is a new bimonthly English-language magazine in Hoi An, Live Hoi An Magazine, that has listings for restaurants, culture and activities (5 November 2009). p 257: The restaurant Casa Verde (99 D Bach Dang) in Hoi An now has a website: http://www.casaverde-hoian.com (23 June 2009). p 258: The jewellery shop Lotus Jewellery in Hoi An has moved to 82 D Tran Phu, which is near the Museum of Trading Ceramics (#31 on the current map). It also has a website: http://www.lotusjewellery-hoian.com (22 December 2009). p 339: There is a new tourist agency in Kon Tum called Highland Eco Tours (150 D Ho Tung Mau, +84-60-391-2788, [email protected]). It is operated by Mr Huynh, a long-time tour guide in the region who used to work for Kon Tum Tourist (13 August 2009). Last updated 10 March 2011. It is quite something to be in a room full of white-haired men and women, to watch them all greeting each other like the old friends that they were, and to realise: These were the ones who showed up. These were the ones who were lithe and eager young Malayans 50 years ago, who thought and talked about politics and showed up for meetings and rallies, in an age before cell phones or Facebook or the Public Order Act. Some of them were also the ones who were arrested and/or detained under the Internal Security Act in 1963 and thereafter. 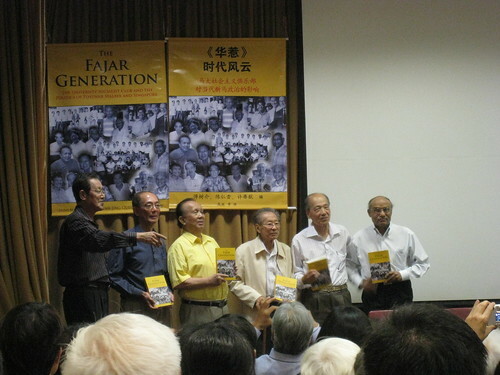 The occasion was the book launch for The Fajar Generation two Saturdays ago, and since then this video of a speech made at the event by Dr Lim Hock Siew --- Singapore's second-longest detainee to be held without being charged --- has been making the rounds. I don't know what I expected when I decided to attend the book launch, other than to get my hands on a copy of the book. But hearing Dr Lim and others speak, and looking around at all the white-haired and still energetic individuals in the room, I couldn't help wondering --- in a rhetorical fashion --- why I was one of the youngest people there and where all the young people today were. Just a few nights earlier at a screening organised by MARUAH, I'd seen Burma VJ, which captures how in 2007 independent Myanmar journalists, monks and ordinary people all showed up, in the streets, where it mattered, at tremendous risk to their own lives. During the question and answer session that followed, someone asked Dr Lim what he thought it would take for young people in Singapore to be politically active again. His answer was short: "Remove the Internal Security Act." That's certainly part of the problem, contributing to the culture of fear, but after 50 years, I think it's going to take more than that for a real political culture to germinate afresh in Singapore. I'm not sure exactly how this happened, but since I got back from Vietnam I've been really busy with one thing or another, without having an overall game plan. And then, before I could figure that out, I started having a bad case of the scratch'n'sniffs on Monday --- scratchy throat, sniffly nose --- which threw this surprisingly busy work schedule even more out of whack. More meaningful posts to follow. I promise! Oddly enough, it was only on our last day in Hoi An that we managed to track down a cafe giai khat in the Old Town, where we could park ourselves on child-sized chairs and dawdle over Vietnamese drip coffee. The cafe was less than two blocks from our hotel, yet we had never noticed it all this while. Local-style cafes aren't easy to find in Hoi An's Old Town. You can't pass a street that doesn't have a tourist-friendly cafe --- you know the kind, occupying a restored Old Town house with street-facing bamboo chairs, free wi-fi and a menu that offers croissants alongside cau lau. But for local-style places, you usually have to head north away from the river, towards Hoi An's other market and into the neighbourhoods with com ga (chicken rice) stalls and karaoke joints. 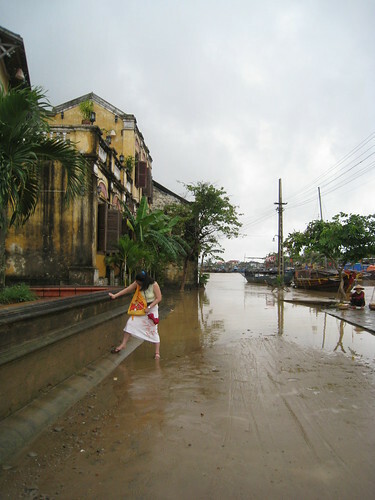 [Tym] is in rainy Hoi An, where there's a starfruit tree outside her window and Christmasy lights at the restaurant across the street. [Tym] is falling in love with Vietnamese salads all over again. [Tym] is watching the river rise over shots of Vietnamese rice wine at the Sleepy Gecko. [Tym] is off to a 'death anniversary lunch' – I honestly have no idea what this will involve, besides Vietnamese food of some kind. [Tym] is going to a Vietnamese wedding. No idea who's getting married, but it seems there will be heaps of food, rice wine and extremely loud hip-hop music involved. [Tym] has had Vietnamese coffee, Italian coffee, Vietnamese red sticky rice liqueur and heaps of passionfruit juice – and it's not even 3pm yet. 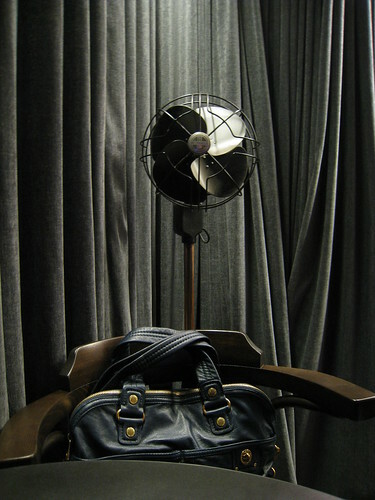 [Tym] has had her last bite of banana flower salad, last gulp of Vietnamese coffee and Biere Larue, and last inhalation of scorching hot air in Hoi An. Next stop: Danang, then Singapore. Yeah, I mostly drank passionfruit juice, Vietnamese coffee and Biere Larue, and stuffed myself silly with salads. Been busy eating and drinking and catching up with friends. Hoi An is as charming as it was last year, despite the intermittent rain we've been having, and the food is even more splendid than I remember. I'm thinking I need to start running food tours here --- sign up in the comments if you're interested. So far on this trip, in between restaurant visits and chilling out in cafes, I've attended a "death anniversary lunch" (i.e. commemorative feast for deceased ancestors) and a Vietnamese wedding (i.e. feast for the wedding couple). The home-cooked food has been great --- who knew that bun and beef stew could taste that good --- as has the exquisite restaurant fare, and I'm wondering why I don't just move here so I can have tip-top meals round the clock. There should be some kind of alluring photo of Hoi An here, but the only photo I've taken today is of the cool gadget charging station at Changi Airport. When we got to Vietnam it was grey and rainy, and though we went out and tramped the wet and sandy streets of Hoi An anyway, it wasn't a good day for pictures. What I really wish I had a picture of, is my expression when I exited Danang Airport. I was peering at the row of men holding cards for the guests whom they were meeting --- and then I spotted, of all people, a friend I had made in Hue last year. 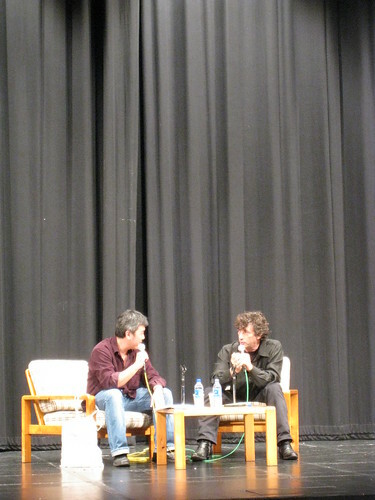 A handshake turned into a hug and several moments of my usual rapid-fire chattering. He was there to pick up some guests arriving on the same flight as me, which is pretty random since he doesn't get a lot of custom from Singapore. Hue is also a good two hours from Danang, so he doesn't make the trip down very often. The sheer serendipity of the meeting left me sitting rather stunned for most of the car ride from Danang to Hoi An. What a great way to arrive back in Vietnam. Earlier this year, at Pin Pin's invitation I wrote the essay "Once Bonded" for s/pores. It was published in July. Over this last weekend, the Chairman of the Public Service Commission (the government body which disburses government scholarships) Eddie Teo delivered a speech "Defending Scholarships but not all Scholars" in London [link updated, 15 August 2016]. Edited to add (4 Nov, around 2 a.m.): Apropos, the Economist has a report on "A tough search for talent", with respect to the civil service or public service in various large Western countries (via Alvin on Facebook). Further edited to add (4 Nov, around 11 a.m.): Today there's a report in the Singapore newspaper Today on the speech: "Young scholars with an attitude" (via Phillip on Facebook). I didn't have a plan, but I had the kindness of friends and somehow everything fell into place, better than if I had tried to orchestrate it weeks ago. People in Singapore are enthuasiastic – but you're all very enthusiastic in a quiet, polite and organised way. We laughed, of course, but in an organised way. Yesterday the planets were in alignment, the ineffable Mr Gaiman did a rollicking Alan Moore impression, and everything fell into glorious place, including the last few paragraphs of the essay I've been struggling to finish since September. I'll write more about its genesis when it's published, but for now I'm pleased that it's done.